I can't believe that the first month of the New Year has already passed, and that February is already here! With New Year resolutions spiraling in my head, there were so many goals I aspired to accomplish in January that, well, didn't even receive a second glance. Thankfully, I have eleven more months to achieve these goals, and maybe February's romanticism will give me the inspiration I need (haha)! With February comes Valentine's Day, and I don't know about you, but I always use this holiday as a reason to pull out the pink clothes and dress up! 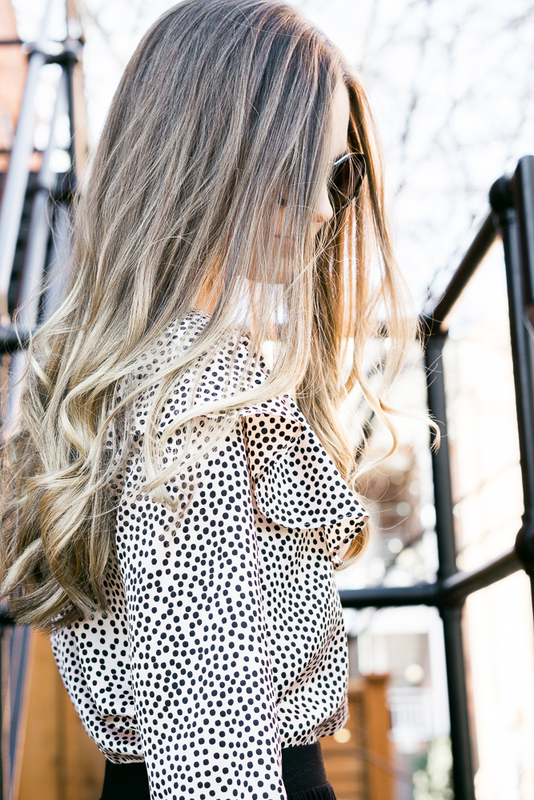 This feminine, ruffle blouse is the newest addition to my wardrobe and I must say that I am smitten! It pairs nicely with skirts and heels, or even a pair of skinny jeans and loafers. The blush pink, polka dots and ruffles add a lovely feminine flair to any outfit, which allows you to look dressed up without even trying! For my Valentine's outfit, I paired it with a flowing midi skirt and a pair of slingback heels, which kept the outfit comfortable, while still looking polished and chic. I hope you all like it as much as I do, and I would love to know what you are wearing this Valentine's Day!